I've had my 11x14 camera for not quite a year, made a few images with it but hardly put it to really hard work.. I've been struggling with getting consistent results I'm happy with mostly through just the natural challenge of going up in size. I only just recently managed to get it succesfully mounted onto the majestic tripod head I purchased for it... up until now it's been just stuck to the Manfrotto tripod. Anyway, so erganomics are no longer an issue. I've already been recently lusting after a 16x20 camera. Of course finance and practicality is a major hurdle in this endeavour. 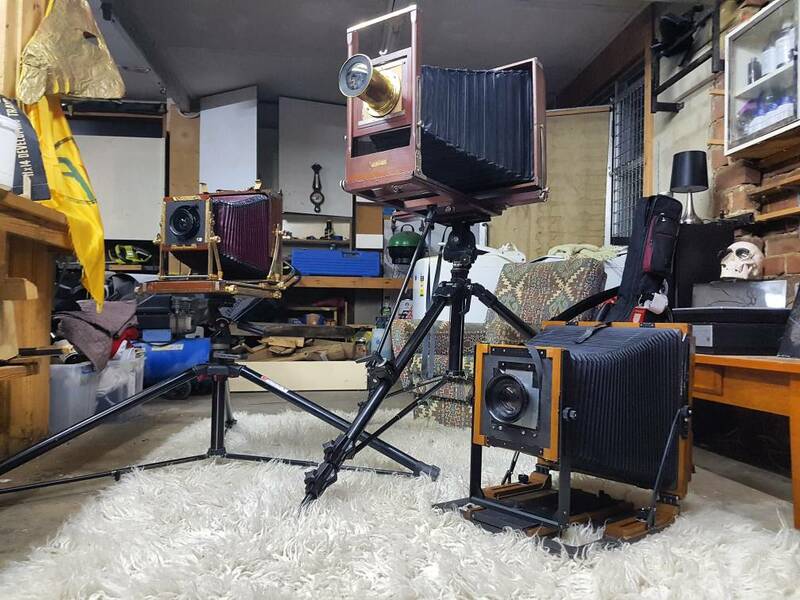 Camera would be used for wet plate, as are both my 8x10 and 11x14 cameras. Realistically speaking, how often to reasonably priced 16x20 (or even 14x17) cameras come up for sale in Australia? I'm just trying to get a feel for how stupid an idea it might be later down the track. A Chamonix 16x20 ready-to-shoot entire wet plate setup popped up a few months ago with all the necessary equipment in Melbourne, I'm not sure how often one might be so lucky as to come across something like that. How many of them do you think are floating around the country? I'd love to even just be able to have a play with one. Re: Already lusting after 16x20..
That Chamonix and Nick Thorley's DIY are the only Ultra Ultra Large I've seen here in Oz. Craig Tuffin's the only other Banquet Camera shooter I know of in Australia besides myself. I'm about to start work on a 1114, once I've finished the 810 and 717 that is. The only other one I'm considering is the 1220. Anything more will necessitate ultra rare, ultra expensive new glass. I've got plate inserts to do 5.5 x 14 panoramas, I still haven't felt comfortable enough to try that out yet. I do have a Rapid Rectilinear that covers up to 16x20. For my purpose it would be used for landscape work, there are plenty of cheap brass lenses out there that would cover the format. I think in the interim I might just get a RSS pinhole camera to satisfy my lust for new toys. Thanks Shane for pointing me onto those! Why wouldn't you build a 16x20 with masks to shoot 12x20 as well? Or is it a size/erganomics thing? I just don't see in 135/4x5/8x10 very well, not like the ratio in print. 1220 is really close to the Golden Ratio, so maybe that's it? I also prefer 1:2.5 to 1:3 in pano formats. And square on my phone! Sold the 8x10 on to a bloke in the UK, replaced it with an 8x10 plate insert for my 11x14 camera so i dont lose that format altogether. Heres a little family photo of all my cameras together. I wonder why i never have any money to do things like go on holidays. Congratulations, Alex, on a truly remarkable family portrait. This will be it for a while, I think Lachlan. I got the 12x20 glass plates cut yesterday and looking at them I think they are the perfect size and aspect ratio for my style of photography, and I've been pondering over some display and framing ideas and I have come up with an awesome solution that allows me to clearly showcase the transparent nature of the glass plates whilst having them backed with a black backing to show the positive image. Anything bigger than 12x20 for me seems a little too over the top and way too costly for a poor barman like myself. 11x14 is really nice too and I think the two formats together make a nice working platform for my landscapes. Hopefully one of the lenses I have ordered arrive this week and I can get out and do some 12x20 this weekend. The bellows and rail on the 12x20 are just a tad too short for the 600mm f8 brass rapid rectilinear lens. Did you get the rear extension for the Korona? If not, we need to chat. I have one for my 7x17. If it's the same size, I'll make one for you.